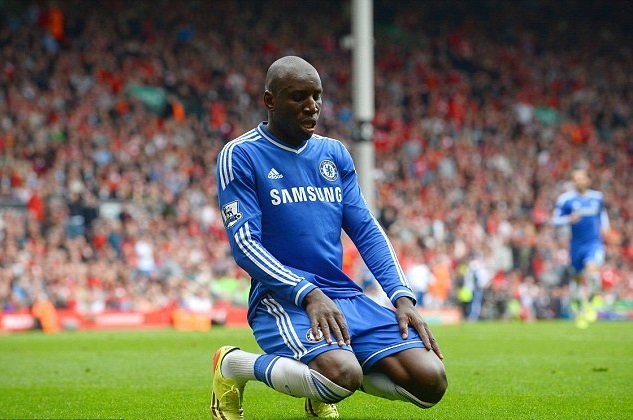 Chelsea striker Demba Ba celebrates a goal by making salat. Senegalese Muslim striker Demba Ba has been lighting up the scoreboards lately for Chelsea of the English Premier League, albeit in a part-time starter’s role that is clearly outside of his comfort zone. Ba, however, stays grounded thanks to his religion, something he’s improved as much during his career as any facet of his football game. “…Today I feel strong in my faith, I feel that I can carry it without any fear, and if people want to attack me on this, I can defend myself as well,” Ba said. Ba scored the opening goal in Chelsea’s 2-0 win at EPL leader Liverpool on Sunday, during which some drama was playing out in the stands. Liverpool is looking into an allegation that one of its fans was hurling racist insults toward Ba. Speaking of people who need to think before they express themselves, two political candidates from the UK Independence Party (UKIP) are under fire for disparaging comments made against track star Mo Farah, a Somali Muslim who runs for Great Britain, and Farah’s religion. Council hopeful David Wycherley questioned in a 2012 Facebook post whether Farah (“an African from Somalia, who trains in America”) should be allowed to compete for Great Britain. Another UKIP council candidate, Jackie Garnett, wrote on Facebook that the UK should “ban Islam and knock down all the mosques.” A UKIP spokesman said that the party would investigate the posts.